In this article, we will create an API for receiving FastReport reports from the server. First of all, let's define what the API is. Literally, this abbreviation stands for software interface of the application. This means that the application has an interface that provides access to its functions. In the context of web applications, an API is a web service with a set of methods interacting with the backend (application or database). In other words, the system is a black box for us, and only web methods allow us to work with it. So, we determined that Web Api is a web service with a set of web methods. These can be four basic CRUD functions supported by the HTTP protocol. They are implemented by requests: GET - read, POST - create, PUT - change, DELETE - delete. Let's create this web application in this article. And FastReport.Core, specially designed for the .Net Core framework, will generate reports for us. 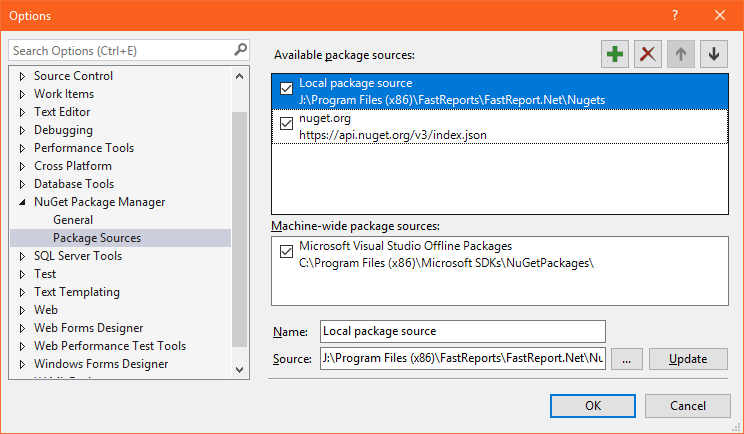 First of all, we need to connect libraries using the Nuget package manager. Select Local package source and change the path to the source. Then, click the Update button. Now, in the package manager, we are available to install FastReport.Core and FastReport.Web. In our demo, we will see how to download reports from the server, how to view them in a browser, and how to pass a parameter to a report. So, that the main entity with which we will work is a report. Let's add the Reports class to the data model, which will have two fields: Id - report identifier, ReportName - report name. In the Controllers package, by default there is one ValuesController.cs class. We use it. We need two report templates that we will demonstrate and a database for them. 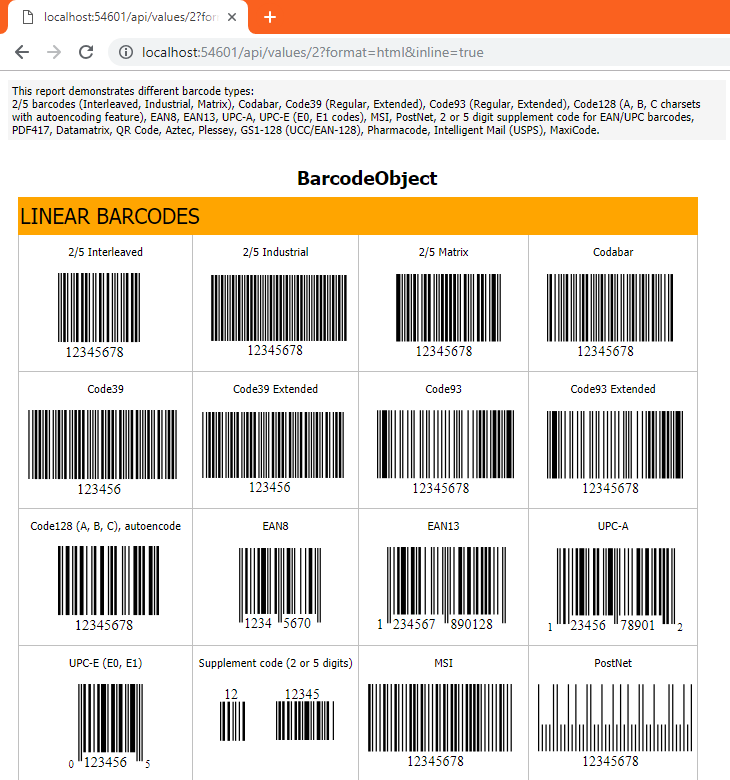 We use the reports from the delivery: Master-Detail.frx and Barcodes.frx. The nwind.xml database for the first report is also taken from the delivery of FR. 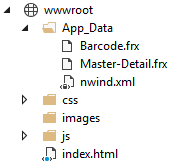 We will place these three files in the App_Data folder, which will be created in the wwwroot directory. The controller class may have a Route attribute that performs the routing role. This means that this class will only accept requests from the specified path. I will make explanations of the code using comments, as well as text inserts between methods. The default method for getting data in the controller is Get. Often it has an overloaded version, as in our case. Action methods usually have an associated attribute. The attribute may have a parameter. Yes, we got quite a great method, but I deliberately did not devote submethods, so you do not lose sight of it. Now we need a web page to show reports. Of course, you can do without it and enter the URL in the address bar. However, with ready-made hyperlinks to reports will be clearer. We added 7 hyperlinks. The first allows you to display a list of available reports. The second one allows you to download a report with index 1 in PDF format. The third hyperlink allows you to download a report with index 1 in HTML format. The fourth - allows you to open a report with index 1 in the browser in PDF format. The fifth - allows you to open a report in your browser with an index of 2 in HTML format. The sixth - allows you to open a report with index 1 in the browser in PDF format and transfer the parameter value to it. The seventh - allows you to open in the browser a report with an index of 1 in HTML format and transfer the parameter value to it. Of course, to display the value of a parameter in a report, you need to add it to the report and to the report page. However, it is not enough to add index.html to the root directory. In order to make this page open by default you need to tweak something in the launch settings. Open the Properties folder, the launchSettings.json file. And delete in two places the line: "launchUrl": "api / values". 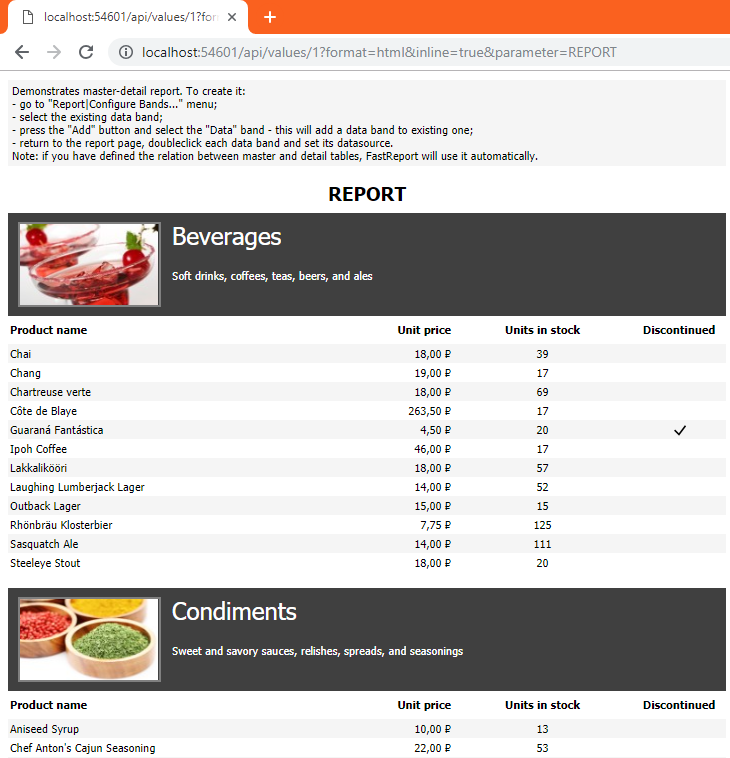 The list of reports is displayed in json format. In .Net Core json completely supplanted xml. And the truth is so concise and understandable. Click on the fifth link. The browser opens the report as html page. Click on the last link. The report also opens in a browser, but pay attention to its title. The header displays the value of the passed parameter - REPORT. 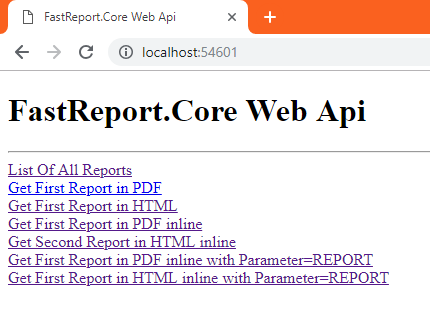 Thus, we learned how to create .Net Core Web API applications using FastReport.Core.